2. 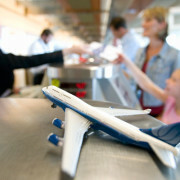 Use carry-on luggage for valuables such as cash, a laptop, and jewelry. Also to be placed in carry-on luggage are cameras and undeveloped film (The X-Ray will not damage film under 800 speed). 3. Tape your personal contact info or business card to the bottom area of the laptop and any other valuable you deem necessary. 4. Avoid wearing metal/foil containing clothing, accessories, and items (such as coins money clips, cell phone, keys, medicine, gum wrappers, batteries, lottery tickets, cigarettes, etc). In the case of things like coins and keys, try placing them altogether in a specified bag so it’s easier to take them out and put them back in later. 5. Avoid wearing shoes that contain metal and/or have thick soles. The reason for this is because shoes do not have to trip off the alarm in order to have their own specific search procedures applied (so nothing can be hidden in the shoes). 6. Sure the Holidays are approaching, but make sure you do the wrapping of the gifts upon arrival, or ship them as opposed to bring them to the airport pre-wrapped as these will be checked by security personnel. 7. Arrive an hour to an hour and a half earlier before your scheduled departure since you will be searched no matter if you plane leaves in 5 minutes or 5 hours. In light of the recent world events, these increased airport security (and beyond) measures are becoming a fact of life with no signs of slowing down anytime soon. However becoming educated and following a simple system can help you avoid foreseeable hassles along this turbulent journey called life.